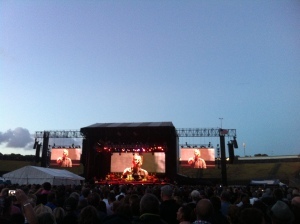 This picture was taken last night at Bruce Springsteen’s epic show in Auckland, New Zealand. He opened with a rendition of Lorde’s ‘Royals’ before embarking on a set list which made those lucky enough to be there smile like drunken goons. His version of ‘Born to Run’ made me laugh out loud it was that damn good. And that’s what surprised me most. I never expected to laugh at a Bruce gig. He drags willing punters on stage to play his guitar and dance with his band. He’s a star but he’s ain’t precious. He’s the likable neighbor who hit the big time and wants everyone to join the party. By the time he finished the entire ‘Born in the USA’ album I wanted to bow to him as if he were some kind of Rock God sent from space. Which makes this keynote speech at SXSW even cooler. Yes it’s an hour long – yes you’ll love it.